Jeff Horn is the new WBO welterweight champion. The bad news is that it was another controversial decision, which is all to common in boxing. The outcome is that boxing has a new name and drawcard in Jeff Horn. The Australian Rocky is a world champion and he won’t be teaching in school again anytime soon. -Horn just challenged Fonsidering how controversial this decision is. loyd Mayweather to a fight in the post-fight interview and then said he would also be open to a Pacquiao rematch. He also added that today is “not the best moment in his life,” saying that is to come with his wife who is pregnant with his first child. What a day for Horn. He won a world title and scored major points with his wife. -Horn is now 17-0-1 and Pacquiao has lost four of his last nine. This was a stunning outcome. Horn gave an amazing effort, but commentators on television and online (myself included) all had Pacquiao as the winner. The legend landed far more punches, but Horn was given the win. What a huge day in Australian boxing history. -Wow! Jeff Horn wins the WBO welterweight title in an upset! In a unanimous decision -- by scores of 117-111, 115-113, 115-113 -- Horn does it! 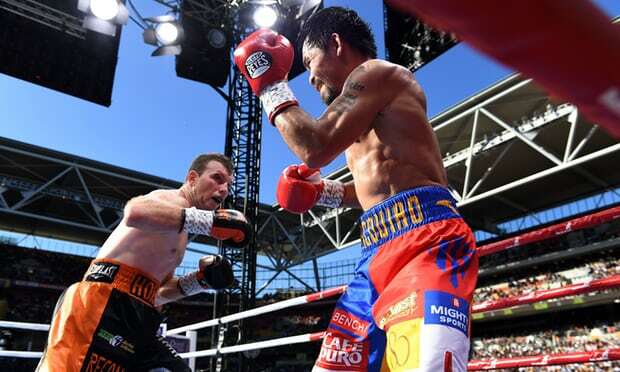 Horn came out throwing everything he had, while Pacquiao oddly didn’t seem to try to stay away to protect his lead. Credit to both men on putting together a great show from start to finish. Give Horn the round. And give him a ton of respect and credit for making it through all 12 rounds.